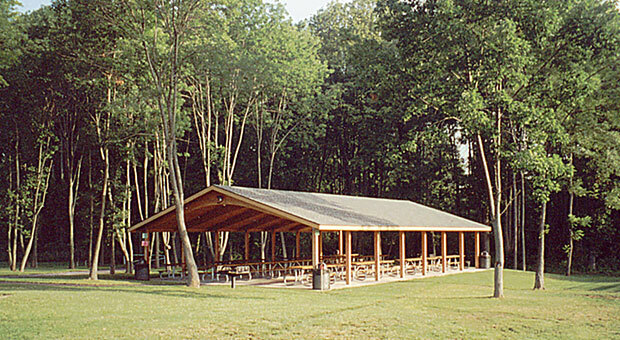 The David M. Petzold Memorial Pavilion at the Upper Saucon Township Community Park is the perfect place to hold a family reunion, company picnic or birthday party. The pavilion houses several picnic tables which comfortably seat up to 100 people. Restrooms, grills, and trash containers are conveniently located near the pavilion. Please call the Township Office at 610-282-1171, ext. 1222 for more information about reserving the pavilion or download a pavilion rental application from this site. The Pavilion is 62′ long × 38′ wide and has twelve tables that are 12′ long. Four of the tables are accessible. There are two large grills that are about 36″ x 27″. Click Here to download a pavilion rental application. Please note that all pavilion reservations are first-come, first served, and that no reservation is completed until a complete application and payment are received. Upper Saucon Township does not own or operate the Southern Lehigh Living Memorial Park on PA 309 in Coopersburg. If you are looking for information about the Lehigh Living Memorial Park, please look here.